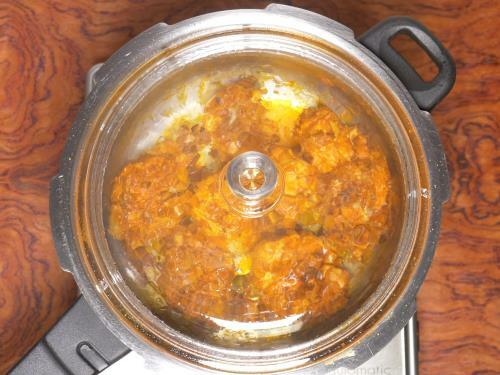 Chicken biryani recipe made in pressure cooker or pot. 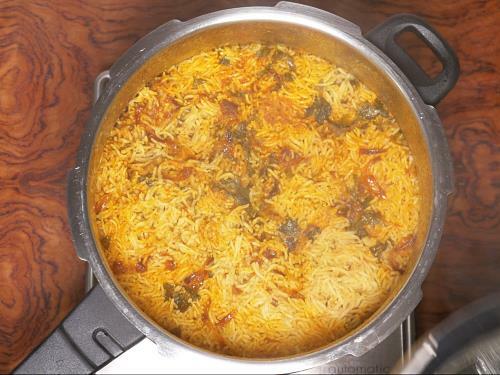 Biryani is one of the most amazing royal delicacies introduced to Indians by the Mughals. Since then it has been much popular and is considered to be a luxurious treat to enjoy on special occasions. Making a chicken biryani in authentic dum style does take some time and needs little expertise. Traditional chicken biryani is made by layering marinated chicken and then layered with parboiled rice, herbs,saffron milk & then ghee. I have shared that traditional hyderabadi biryani here. 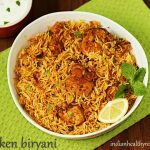 The recipe shared here in this post details a short cut method to make a simple one pot delicious chicken biryani in a pressure cooker or a pot. So what I have shared in this post is not a dum style biriyani yet it will surprise you with a good aroma and taste. This recipe yields a chicken biryani that isn’t too oily, spicy, hot or pungent as it looks to be in the pics. However you can reduce the amount of red chili powder if you do not prefer the heat. You can enjoy this with a Raita, Shorba and papads. What you need for a good biryani? To make a good biryani, always use best quality ingredients. The choice of good quality basmati rice, whole spices, spice powders, chicken & ghee all contribute to the flavors of chicken biryani. 1.Basmati rice: There are so many kinds of basmati rice available in the market. For best results choose premium quality basmati rice that is labelled as AGED. This kind of rice is more firm & fluffs up well in chicken biryani without turning mushy. Aged rice is also more fragrant. Though this biryani is made in a pressure cooker or pot, the texture of rice grains will come out right without getting mushy if made with aged rice. 2.Biryani masala (spices): Good quality whole spices & spice powders elevate the flavor of chicken biryani. So choose a good quality ready made garam masala powder or biryani masala. I am also sharing the ingredients for an instant biriyani masala powder. If you do not have a ready made or store bought masala, you can make it in just few minutes. 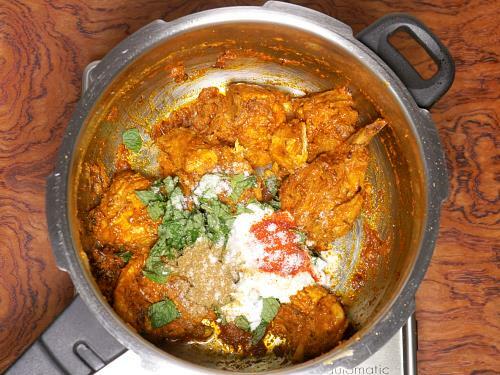 3.Chicken: We usually use up the cut whole chicken to make the chicken biryani. However I always find chicken breast pieces dry out if not marinated well with yogurt. If you prefer soft, tender & succulent pieces of chicken in your biryani, then just use chicken thighs & drumsticks. Always use bone-in chicken as it helps the dish to turn out more flavorful. 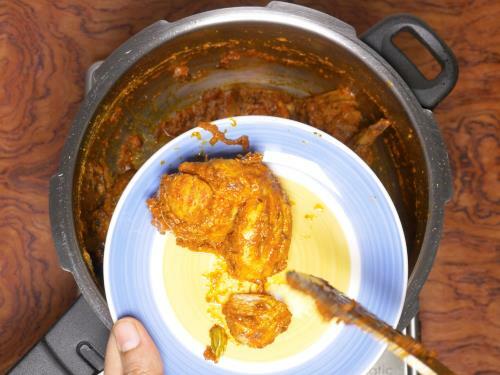 4.Ghee : Traditionally chicken biryani was made using ghee. Since this recipe does not follow the traditional method, you can also make it using oil. But ghee adds a unique aroma to the dish. 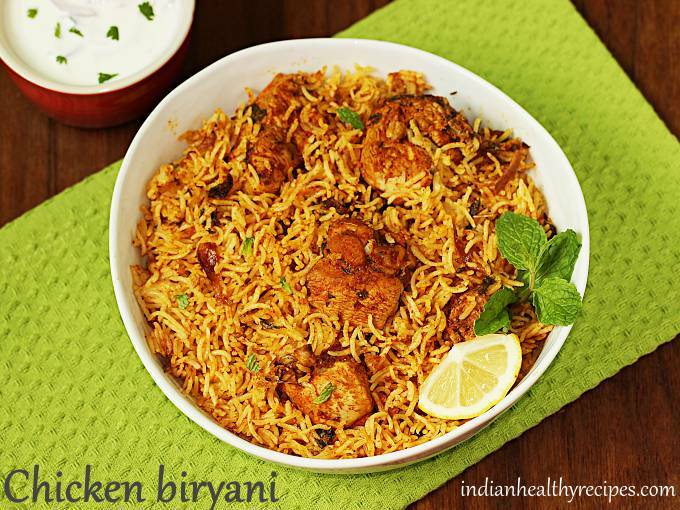 How to make the best chicken biryani? 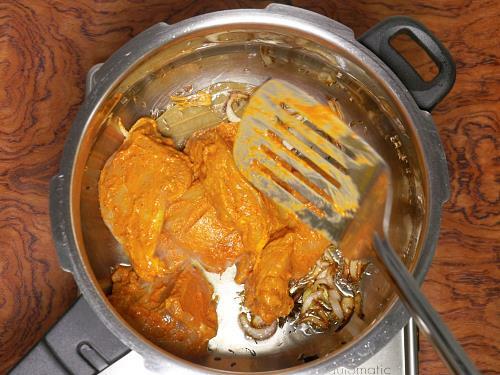 Marination: Marinating chicken with yogurt & spices is the first key step to make the best chicken biryani. 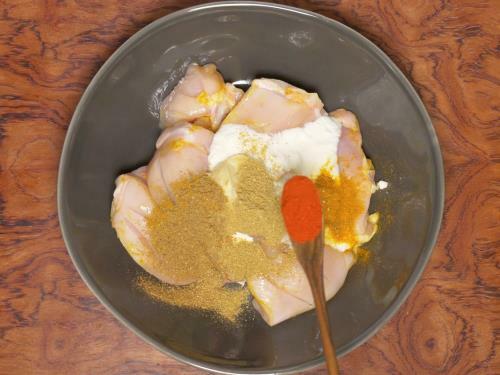 Yogurt tenderizes the chicken & the spices enhance the flavors. Marinating and resting chicken makes it soft & succulent, so do not skip that. 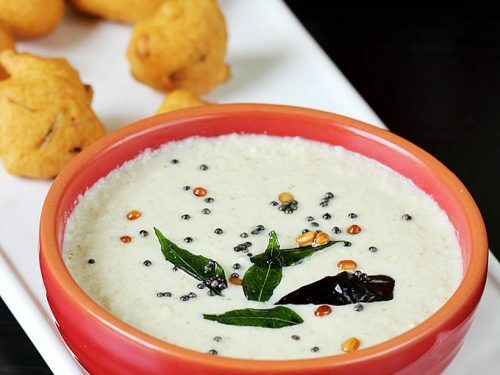 If you do not eat curd then can substitute it with coconut milk. Preparing rice : Basmati rice has to be rinsed very well a few times in ample amount of water to get rid of the starch. This prevents the rice grains from turning mushy. Soaking the rice helps to cook the rice grains to fluffy & long. So do not skip rinsing & soaking the rice well before using. 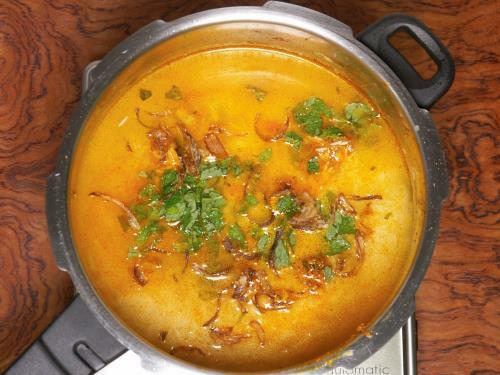 Water : This recipe uses plain water to cook the chicken biryani. However it can be replaced with coconut milk or chicken stock. The quantity of water I have mentioned in the recipe card works well for me with Lalquilla old malai basmati rice. This ratio works pretty well with any aged basmati rice. Please do adjust the amount of heat in the recipe. 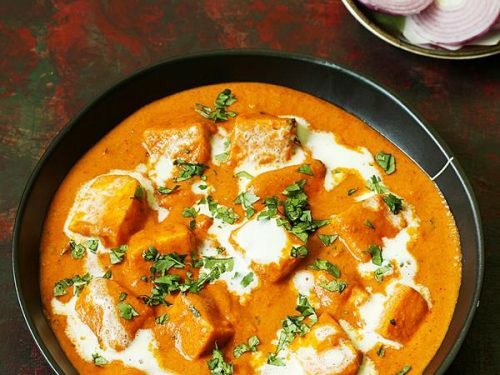 My recipes are usually low on heat for the Indian taste buds. Since I have young kids at home., these levels work well for us. 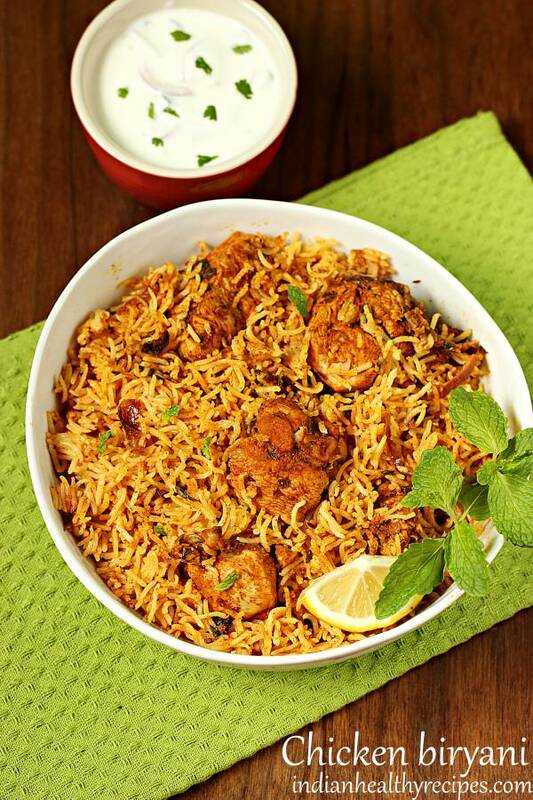 Aromatic, delicious and spicy one pot chicken biryani made in pressure cooker or pot. This is a beginners recipe and can made with ease. Chicken biryani is served with raita or salan (gravy). Make gashes on the chicken. 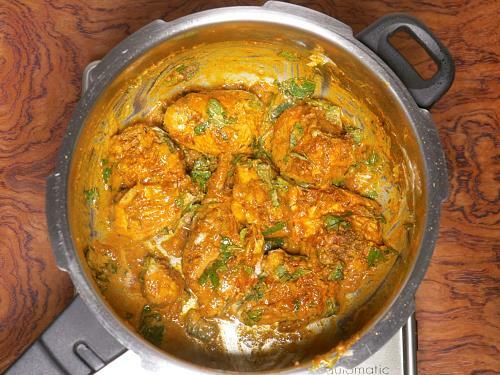 Marinate with curd, ginger garlic paste, ½ tsp salt, biryani masala powder, turmeric & chili powder. Set aside for 1 hour. Wash basmati rice thrice and soak for 30 mins. Drain to a colander. Heat ghee or oil in a cooker or pot. 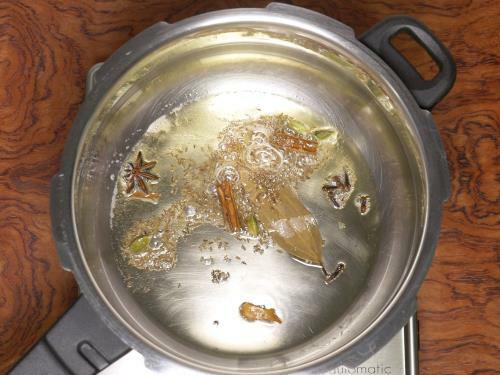 Saute whatever spices you have – bay leaf, cardamoms, cloves, cinnamon, star anise, shahi jeera & mace for a minute. Fry onions stirring often until light brown. Saute chicken for 5 mins on a medium heat. Cover & cook on a low flame until the chicken is soft cooked. 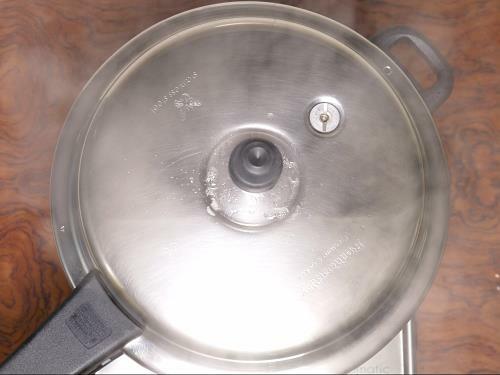 Saute to evaporate excess moisture in pot. Add curd, pudina, green chili, red chili powder, ¼ tsp salt, 1 tsp biryani masala. Mix everything well and layer chicken evenly at the bottom. Spread rice in a layer over the chicken. Pour 3 cups water or thin coconut milk to a bowl. Add ½ to ¾ tsp salt and mix. Taste the water. It must be slightly salty. Pour 2 cups of this water across the sides of the cooker or pot. Gently pour 1 cup water on top of the rice. Level the rice if needed. Sprinkle mint & fried onions. Cooker method – Set the flame to medium high. Cover & place the whistle. Cook for 1 whistle. Set the cooker away from the burner to stop cooking further. Pot method – If cooking in a pot, cover and cook on a medium flame until the rice is done to your liking. Rest until the pressure settles. Fluff up the chicken biryani with a fork. Serve from top to the bottom layer. Each serving gets biryani rice from top and chicken from the bottom layer. Enjoy chicken biryani with raita and sliced veggies, papad and shorba. 1. To make biryani masala or garam masala – Powder together very small piece of nutmeg, 5 cardamoms, ½ tsp pepper, 5 cloves, 1 to 2 inch cinnamon, ½ tsp fennel seeds, ½ tsp stone flower. 2. Yogurt or curd: Do not use sour curd. If the curd is slightly sour then skip using lemon juice. 3. 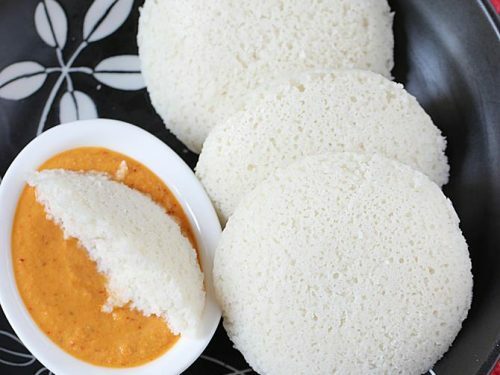 Rice: I have used lalquilla basmati rice, old malai. Any other basmati rice may need less water. Make sure to use as needed. 1. If using ready made biryani powder, skip this step. To make biryani masala powder, add nutmeg, cardamoms, pepper, cloves, cinnamon, fennel and stone flower to a mixer jar. Make a fine powder. Set this aside. 2. Make gashes on the chicken and add to a bowl. 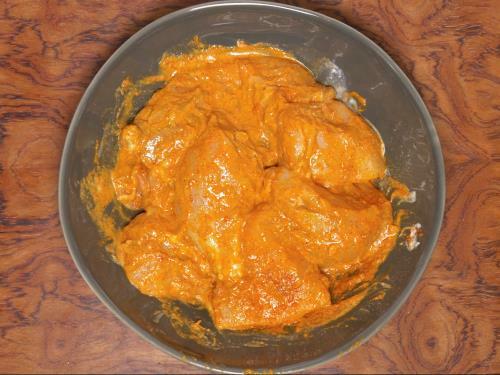 Also add 3 tbsps curd, ginger garlic paste, 1 tbsp biriyani masala powder, 1/2 tsp salt, red chili powder and turmeric. Reduce the amount of chili powder, if you have kids home. 3. Mix everything well and marinate the chicken. Cover and set this aside for 1 hour. You can also rest it overnight in the fridge. 4. Add basmati rice to a large pot and wash it at least thrice. Soak it for 30 mins. Drain to a colander after 30 mins. 6. Heat ghee or oil in a pot or pressure cooker. Make sure you use a large cooker for this. Saute spices for a minute. 7. 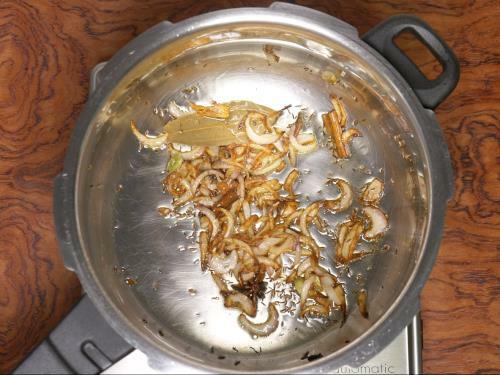 Fry onions until light brown. 9. Saute the chicken on a medium heat for 5 mins. Lower the flame completely. Cover and cook until the chicken is soft and completely cooked. 10. Check if the chicken is cooked. At this stage there is no moisture left in the cooker. 11. Check the salt and add as needed. I added about 1/4 tsp at this stage. Also add 4 tbsps curd, 1/4 to 1/2 tsp chili powder (optional), green chili, mint and biryani masala. I deseeded the chilies and used. Skip if you have kids home. 12. Mix everything well. 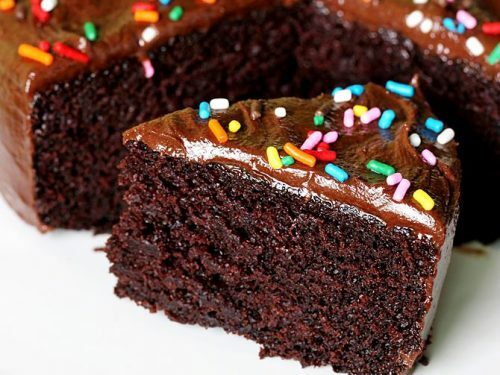 Spread it evenly in a single layer. 13. Layer the rice all over the chicken. Pour 3 cups water or coconut milk to a bowl and add salt. Stir and taste the water. It must be slightly salty. Pour 2 cups water across the sides of the cooker or pot. Pour 1 more cup of water over the rice gently. 14. Level the rice gently on top. Add some pudina and fried onions. If you have not added salt to water earlier, sprinkle it now as needed. I used about 3/4 tsp sea salt. Do not mix up everything, the taste of the biryani cooked in the shown method is different. 19. Finally set the flame to medium high on a regular burner. Cover and cook for 1 whistle. If cooking in a pot, cook until the rice is done completely. Remove the cooker from the hot burner to stop cooking further. 20. When the pressure goes down, open the lid. Gently fluff up with a fork. 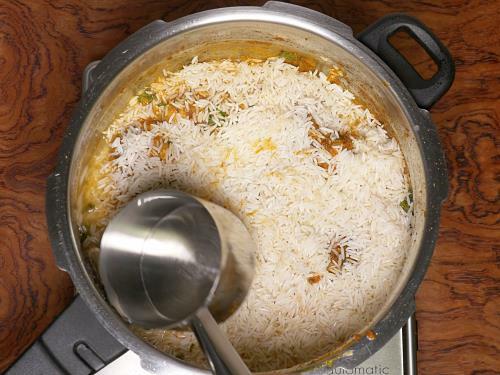 Serve chicken biryani in layers – top layer with rice and bottom layer with chicken. 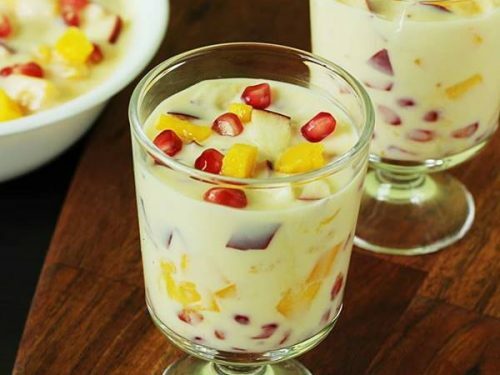 Enjoy with raita or shorba. I try your recipes very often and they turn out very delicious everytime. My husband likes them very much. Thanks for sharing them. You are welcome. Great! so happy to know your food turns out delicious. Thanks a lot. Keep trying & enjoy the foods. Glad to know the recipes turned out well. Thanks for the comment. Loved your Chicken Biriyani recipe, Swasthi! My daughter took it to share with her friends in college, and they enjoyed every bite of it! I have ear-marked this recipe to make it again. In fact, Im cooking it today, to treat some friends. Thanks so much. So glad to know your chicken biryani turned out good. Hope the girls enjoyed it. Thank you so much for the comment and the rating. hi sis….if 1 cup basmati rice mean hoe many water need to use for cook ths rice. hi sis…thank you so much i hv done a super n good taste of byrani,my husband like it so much,thanks alot. You are welcome. Very happy to know your biryani turned out good. Thanks for the comment. I want to try out the biryani recipe.. For 2 cups of rice is 3 cups of water and how much of coconut milk? 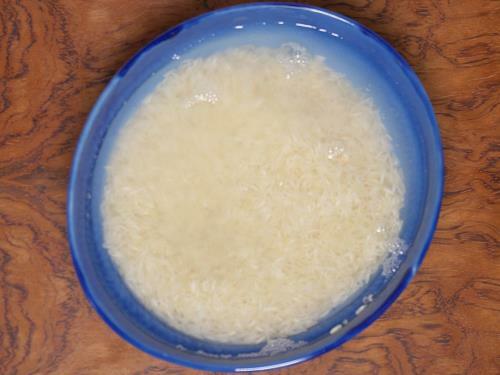 For 2 cups basmati rice, you can use 3 cups of liquid. Either 3 cups water or 3 cups thin coconut milk. You can also use 2 cups water and 1 cup coconut milk. Hope this helps. The biryani recipe was the best. It came out very well. My husband and kids loved it so much. You are an inspiration to people like me. Great! Happy to know your chicken biryani turned out good. You are welcome. Thank you so much for the comment. hello, if i want to make this in the instant pot pressure cooker, what time should i set it for? and do quick release or after 5-15 mins? You can set it to 5 mins high pressure. Natural pressure release for 5 mins, then the rest manual release. I use 2.25 cups water for 2 cups aged basamati rice. I use lalquilla old malai. Thank you so much for this very descriptive recipe! I’m trying this recipe tomorrow and wanted to know if I double the quantity of rice does that mean I need to wait for 2 whistles on the pressure cooker? I’m using 4 cups of basmati rice. You are welcome. No. If you double the recipe, you don’t need to increase the cook time & don’t have to wait for more whistles. Just cook the biryani for 1 whistle. 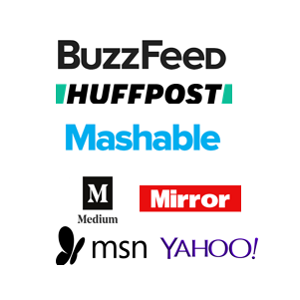 Hi Swasthi, yours is the go-to blog for me when I want to cook something special. I have tried many of your recipes and all have come out well. Keep up your good work. So glad to know this. Thanks a lot. Heyy Swathi… It looks yummy 😋. And seems easy & qiuck. I am going to try definitely. Can you help me, am thinking to buy Butterfly stainless Steel Pressure cooker which U have used in this recipe. Hw is its service can I go with it.? Thanks. Cooker works very well as long as the gasket & safety values are in condition. I am unable to use it since 6 months as the gaskets are not available here in Singapore. I do not know about the service. So happy to know you are a Master chef now. Thanks for the comment. easy, also explained well about the step by step process from preparation till cooking. thanks Swasthi. Your effort is really appreciated. Loved it! Love the recipe, easy and tasty..
Tomato is not mentioned here… Should we omit it? Thanks for the wow recipe.tried in my husband’s b’day n it came out to b surprisingly delicious.thanks again. Welcome Sasmita. Belated birthday wishes to your husband. Thank you so much. Hello. I tried this chicken Biryani recipe of yours and it was really yummy. I doubled the amount for 3 ppl to enjoy it in lunch and dinner both but now only one serving is remaining and have to think of something else for dinner now😁. 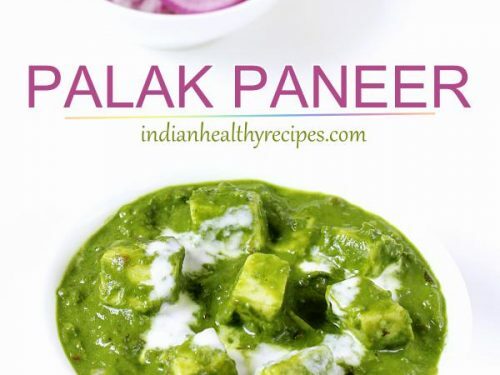 Thankyou for this tasty and well explained recipe. So glad to know you all liked it. Thank you so much for the comment.